The EXceptionals was established with a very clear goal: to boost employment levels for those with criminal records. We aim to act as a bridge between organisations working hands on with people with criminal records, and employers who either through a desire to do good, or a commercial need, are looking to employ them. We are very proud to highlight the great work that these organisations that support ex-offenders deliver. Our regular blogs detail their great work and we often put out video interviews with forward thinking employers who are already hiring people with a conviction. However, the core of our work is trying to build partnerships between these organisations and employers taking their first steps in to actively employing ex-offenders. For many employers once they have made the decision to put in place an active policy to search for people who have encountered the criminal justice system they often don't know where to start. To begin with, how exactly do they find suitable candidates? They are also likely to have a number of questions around managing the process, for example, how to approach disclosure, and how to ensure they are sensitive to any other issues that individuals may be facing in other areas of their lives. 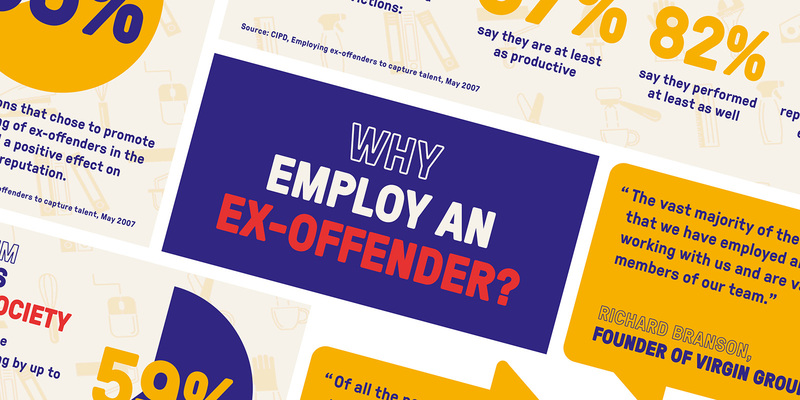 We believe that to increase the number of employers actively employing ex-offenders we need to both show the brilliance of the people within this talent pool and ensure any problems that employers perceive are met with solutions. The single best people to do this are the front line organisations that have a deep understanding of not just the bureaucracy that surrounds the criminal justice sector, but the people they are working with as well. We feel that as an intermediary that sits between both employers and criminal justice organisations we are uniquely placed to help both these groups achieve the outcomes they are looking for. We facilitate this all through our Directory. A resource that presents a list of organisations that can help employers on their journey to finding great new employees who happen to have a criminal record. Through partnerships employers can be introduced to the candidates that are best suited to the roles they are looking to fill and at the same time address any issues they may have. Our aim is to build long term partnerships between businesses and the organisations supporting people with criminal records. If you are a business looking for support to employ ex-offenders, or an organisation who supports people with a conviction and you are interested in building partnerships via our Directory please do get in touch. We can help you take the first steps.